Culture: Highly conservative public sector organization, average employee age of 47, strong status quo and intentional as well as un-intention hiding of information throughout the organization. In this organization the cube-farm is alive and well and there is strong separation between departments and an emphasis on job descriptions. Making anything visible is not such a good idea and disruption to the existing culture is seen as “chaos”. The Crack: We had started a Lean Transformation and a challenge was that in a 250 person department (4000 company wide) it was difficult to find out who the early adopters were. 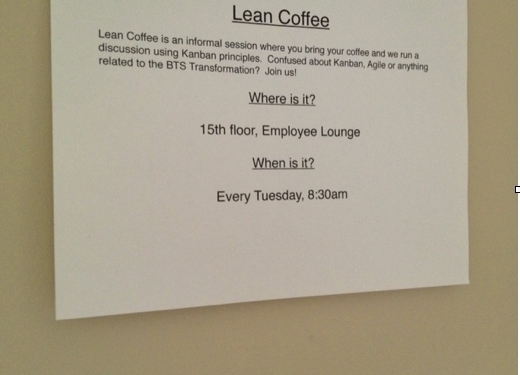 The Hack: I posted a “Lean Coffee” sign in various public and highly trafficked areas of the organization so I could learn: Who were early adopters? What problems did they have? What topics would they want to discuss? Who would show up from which departments? Hack Zone: Green Zone Hack. Very safe yet highly un-usual for this organization. The Result: 9 people showed up. A mix of developers, business analysts, project managers and 1 person from the project management office who had a background in lean manufacturing. 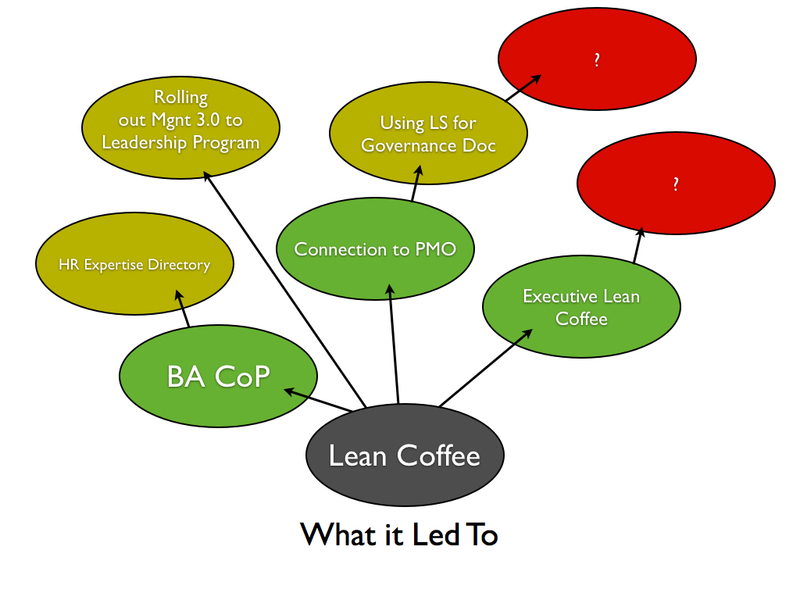 What it Led to: I ran this session weekly and over time, only business analysts kept showing up so we started a business analyst community of practice. The community of practice led to me getting connected to HR to help create an “Expertise Directory” across the organization. The connection with HR led to interest in getting Management 3.0 into the official leadership curriculum across the organization. The connection to the person in the PMO led to our transformation team being able to bring Lean practices into the PMO and the removal and consolidation of status reports. 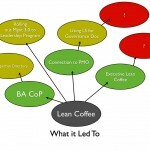 This connection led to being able to use a Lean Startup Business Model Canvas instead of more heavy-weight documents at project inception. 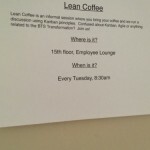 The success of this Lean Coffee session inspired a “Director Lean Coffee” session where any employee could come to a session and get questions answered directly from an executive. Most importantly, this “hack” allowed me to find the right people in the organization so I could establish a relationship with them and help them look at the organization with a different lens. It was safe and simple and yielded positive results.